Beschloss, Michael R (2003). The Conquerors: Roosevelt, Truman and the Destruction of Hitler's Germany, 1941-1945. Simon and Schuster. ISBN 0-7432-6085-6. De Vos, Luc; Rooms, Etienne (2006) (Dutch). Het Belgisch buitenlands beleid: Geschiedenis en actoren. Acco. ISBN 90-334-5973-6. Giangreco, D. M.; Griffin, Robert E. (1988). Airbridge to Berlin : The Berlin Crisis of 1948, Its Origins and Aftermath. Presidio Press. ISBN 0-89141-329-4. http://www.trumanlibrary.org/whistlestop/BERLIN_A/INDEX.HTM. Miller, Roger Gene (2000). 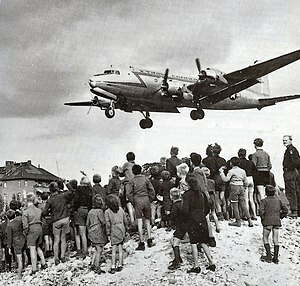 To Save a City: The Berlin Airlift, 1948-1949. Texas A&M University Press. ISBN 0-89096-967-1. Nash, Gary B.; Jeffrey, Julie Roy; Howe, John R.; Frederick, Peter J. (2007). The American People Creating a Nation and a Society (6th izd.). New York: Longman. ISBN 978-0-205-56843-7. Turner, Henry Ashby (1987). The Two Germanies Since 1945: East and West. Yale University Press. ISBN 0-300-03865-8. Ova stranica je zadnji put izmijenjena 16:29, 23 juli 2014.